My sister took this pic of my niece on her cell phone and when she looked at it she clearly saw a face of what looks like a baby or small child. 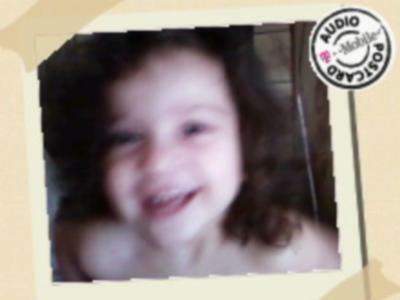 Brenda Edited a face over her right shoulder saying left was wrong, but there IS a face over her LEFT shoulder as well!! And it DOES look like a baby. People are fixating on the right shoulder now because it's more clear. Funny. Um, that's her LEFT shoulder. And this is simply a digital artifact from a cheap CCD or CMOS chip. At first I couldnt see it but now I can. I think that ghosts are real or might be someone trying to communicate with you. If you look closer it is not a child, it must be someone from the past. Someone who died or not. You have to check every picture and it is there. Then you are truly haunted !!!!!! There is somethink there. Who knows. I'm not saying that ghosts are fake but almost all the pictures taken were by cell phone. It could be a glitch in the phone. E. G. Flash stained lens. I subscribe to muse and it showed a picture of a woman's shadow made out of magnetic numbers. Artists can't do such things but there is no reason not to believe in ghosts. After looking at this picture again I would definitely think there is some reasonable explanation for it. By the way the face is situated behind the little girl's shoulder YET also in front of her hair would make me think there is possibly a pane of glass in between the subject and the photographer which is reflecting the latter image back to the camera. I've had a couple of similar shots myself in the past but recognised what had happened therefore thought nothing of them. @Mark Cross. There really is no need to be so aggressive! Different people have different opinions, it is just the way of the world. If you thus agree, make your point in a civilised manner as opposed to getting angry. It is plainly obvious that this picture is the real thing,as much as I would like to say that it is the camera or whatever. Though I have to say it doesn't look like the face of a child to me, but more of a man. I assure everyone that this pic is real...it has not been doctored in any way shape or form...i am not computer savy. It was taken with a cell phone camera and is posted here as is...wether it is the resolutin pixels or lighting is what is in question. I am really sorry, I'm fasenated withghosts but I can't see anything. Love the idea tho. This looks very much like some of the photos that I have caught. I don't think it's a baby though. Looks more like a young man. This is NOT a baby!!! If this is real photo and not prank this is serious stuff! Not baby! It looks pretty real... it's hard to know if it's genuine though. Oh, I see it. 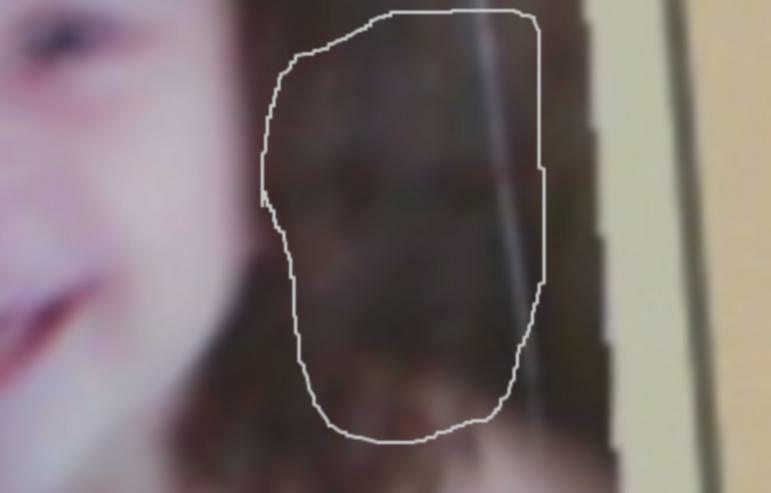 People were saying that it was just due to poor camera quality, but if it was, then why wouldn't the ghost's face be blurry like the girl's? This is a really intriguing picture, and one of the best I have seen so far. I do think, though, that it is down to a combination of bad lighting and poor resolution. That is not a baby looks more like a man.And it is over the left shoulder not the right shoulder but right side of the picture. This is matrixing caused by a poor quality image, you can see from the blurriness of the girls face that this is nothing but motion blur. It looks like a baby that died in your house.What ever you do don't show Elsa. This looks like a little baby boy. Try to take another picture of Elsa then someone else or take a pic of your house and see what it is. For 1 or 2 nights stay and see if you can hear anything. P.S. Elsa is really cute. I am NOT saying that the picture is fake, but I will say that some things look real and fake all in the same. Look closely (very easy if you have a MacBook Pro) part of the face and neck of the ghost is super imposed on the girl herself rather then behind.. It is just a small blur but yet still a big factor when it comes to paranormal proof. The resolution on a camera is not high enough to capture a ghost this clearly. The girl was moving and she is very blurry yet the ghost is clear as day, this makes me scratch my head. I have some pictures and usually the object in question is slightly blurry and the main focus is pretty clear and if the main focus is blurry, so is the object in question. I am very sure that it is possible and I won't rule it out, It could very well be real and I hope it is because this would be great proof to show off, but I have taken pictures with my cell and there has been ghost like pictures in multiple shots... then I cleaned my lens. This could be the situation as well.. I read something on how someone thought this was a demon. Welp,, When I went to seminary school, I had to learn Demonology and I was taught that I would get an EVP easier then a picture.. let alone on a camera phone. Okay. Well I don't know. But if you look up in the top left. It looks like a demon. I have been on this site for the last three hours looking at photos and out of all the photos I have seen, MAYBE 3 i felt were authentic and this is one of them. I wish you would have posted the original though, it would have been alot better. This is hard to fake or even photoshop, I like when I dont have to search for the so called face and it just pops out at me like this one did. Kudos to you on the pic and please post more if you find any or take any more. I would go through all the other pics preferably of your niece to see if you happened to have captured any more. Saw it right away. Eyes, nose, mouth and ears and the outline of a head. This is very good. Its better proof then some lights shining through some trees and see shadows of leaves making it look like a person (or michael jackson) that are floating out there. people want proof and not light shows and camera malfunctins. Yours can be added to the proof pile. Good job. Brenda, you circled the face over her Left shoulder. The face I first saw is the one over her Right shoulder. Very spooky. Good picture. I didn't have to look hard to find it, even in the original, I am not so sure that is matrixing, because of all of the detail. You can see the strands of hair, so it is indeed freaky to me too. I couldn't see the face at first, Elsa. I zoomed in and there it was - plain as day. I really want to say this is matrixing, probably because the resolution of the pic is what it is. However, it is amazingly suggestive that someone is there. And it doesn't look to me like a baby. Please guys, what do you think this is?